NO SUBSCRIPTIONS; we offer additional dictionaries, graded readers, and other features as one-time purchases, but there are absolutely no subscriptions in our app. 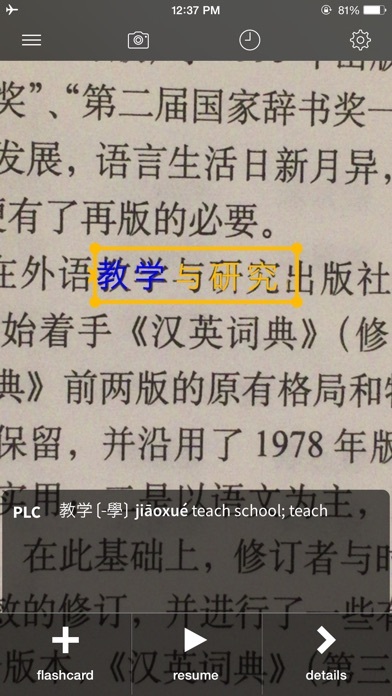 Pleco is the ultimate Chinese learning companion: an integrated dictionary / document reader / flashcard system with fullscreen handwriting input and live OCR, from a company that's been making the world's best mobile Chinese learning apps since 2001. Major features: ($ = paid add-on) • Amazing dictionaries. 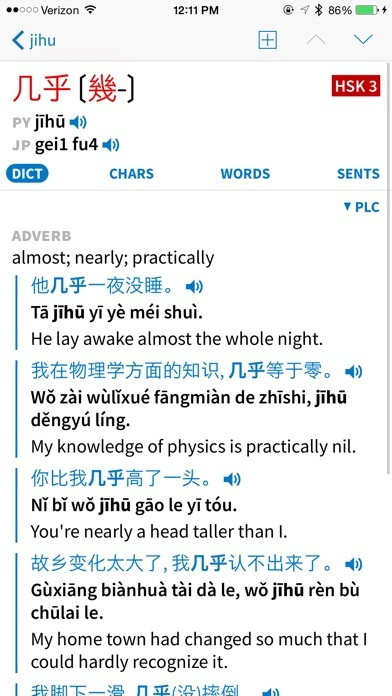 We offer two free built-in dictionaries: the popular open-source CC-CEDICT, with over 110,000 frequently-updated entries, and our own PLC dictionary, with 125,000 entries, parts of speech, and over 25,000 example sentences (with Pinyin). More than two dozen other dictionaries are available as free and paid ($) add-ons, including licensed titles from well-known publishers like Oxford, Longman, FLTRP, Tuttle, SLPH, and Commercial Press. • Powerful merged search: look up words by Chinese characters, Pinyin (spaces / tones optional), or English, with support for wildcards and full-text search. And no need to tediously flip between all of those dictionaries to find a word - just type in your search term and instantly get a combined, frequency-sorted result list. • Links and cross-references: easily look up character components, break down words into individual characters, look up lists of words containing a particular character, and search across all dictionaries for example sentences containing a word. 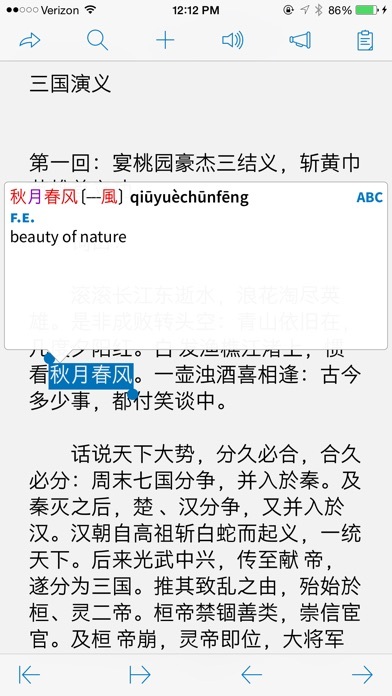 • Gorgeous typography: see it for yourself in our screenshots - we think we're one of the best-looking Chinese dictionaries around. Alternate Kai/Song/Xing-style Chinese fonts are also available ($). • PRC/HK/Taiwan-friendly: every part of Pleco supports both traditional and simplified characters, headword pronunciations can be shown in Zhuyin as well as in Pinyin, and several dictionaries even support Cantonese. • Audio: Hear Mandarin and Cantonese for words and example sentences using iOS' free built-in text-to-speech system. We also offer add-ons ($) with native-speaker Mandarin and Cantonese recordings, plus higher-quality Mandarin text-to-speech options. • Document Reader: bring in text from the clipboard and tap on words in it to instantly look them up. Upgrade ($) adds support for tap-lookups in text, HTML, DOC, DOCX, PDF, and EPUB files. We also offer graded readings ($). 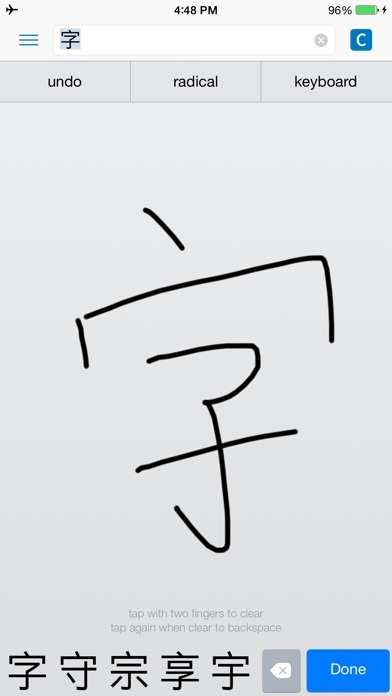 • OCR: look up words simply by pointing your device's camera at them, or by tapping on them in a still image. ($) • Fullscreen handwriting: use your device's whole screen instead of just a little box. Extremely accurate and highly tolerant of stroke order mistakes. ($) • Flashcards: create a card from any dictionary entry with a single button tap, import premade word lists, use advanced memorization techniques like SRS, and study in a variety of modes including fill-in-the-blanks handwriting and tone drills. ($) • Stroke Order Diagrams: animations showing you how to draw each character; 500 characters for free, 28,000 in paid ($) version. • User dictionaries: create new dictionary entries right on your device as you encounter new words. ($) • Absolutely no ads. We also offer famously excellent customer support and an active user community at http://www.plecoforums.com. And we're constantly working to make our products better; our sales and customer base have been growing for 18 years across 4 different mobile platforms. You can be confident that we'll still be fixing bugs and adding features for years to come. Our paid add-ons can be transferred to other devices that link to your iTunes account just like any other paid iTunes content; simply install our free app, open up the "Add-ons" screen, and tap on the "Restore Purchases" button to activate your purchase on each device. Please contact us at [email protected], via the form at http://www.pleco.com/contact.html, or using the in-app "Contact Support" command with any questions - we'll be delighted to hear from you.